Since I've been focusing on simplifying my life and limiting my clothing, shoes and accessories, I thought it'd be fun to show a different outfit each day of October from my small allotment. Sometimes having boundaries helps my creativity and I love the challenge of mixing things up. I want to prove to myself that having a small amount of clothes doesn't limit my options. I'm obviously not a fashionista, but I do want to look presentable. So I'm hoping by the end of this month I'll have a nice group of pictures to reference and hope that it'll inspire you too. My style is self-defined as comfy classic. Today's outfit is French-inspired. I love the brightness of the red jeans against the polka-dot blouse. This outfit makes me feel professional with a splash of fun. The flowing fabric is flattering and the elastic waistline highlights my waist. I'm an artist and love color. Red is one of my favorite accent colors but I use it sparingly. I only have this one pop of red in my entire wardrobe. Colored jeans really help a limited wardrobe stretch. It creates more crossover for mixing and matching. 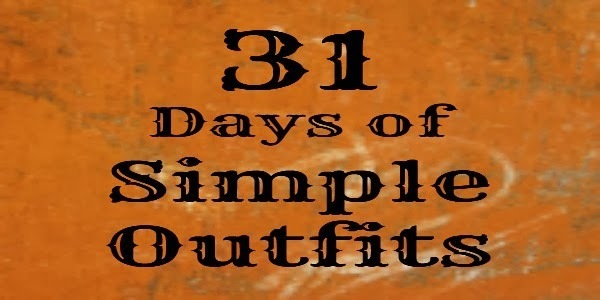 I'm joining up with the The Nesting Place's 31 Days Challenge. There are so many great subjects, you should check it out! What is your favorite accent color? I'm so excited for this! I can't wait to read all the posts. I love the topic of simple outfits. Thanks Amanda, I hope it's helpful!